Wizard’s Museum Construction KitTM gives you, in one small box, everything you need to build several Wizard’s Museums. Among 2-5 friends, the process of assembling your tiles of magical artifacts into glorious (or at least amusing) collections is a charming way to pass the time. One delightful difference between a Wizard’s Museum and the real thing is the speed of assembly. In the real world, the process of building a museum takes decades to get right. From planning the building to digging just the right bones out of the ground, you’re in for a job. The Wizard’s Museum Construction Kit, on the other hand, provides you with an entire array of magical artifacts. From the The Fountain of the Dragon’s Lament to The Orb of Things Best Forgotten, you can be sure that you’ll have none of the problems of negotiating archaeological rights or sealing dimensional rifts of arcane power, but all of the fun of time spent with your friends. Since the Wizard’s Museums can be assembled in 15-30 minutes in most cases, you will probably find yourself constructing several in an afternoon with this family friendly board game. 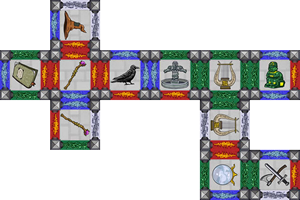 With comfortable 2 x 2 tiles, quick interactive play (take a look), and an easy twist to turn any curse into a blessing, Wizard’s Museum Construction KitTM is a charming way to pass the time. Wizard’s Museum Construction KitTM appeals to lovers of board and card games and to fans of all things magical. Those looking for a wizard board game will find satisfying, quick play around the table with friends. Those looking for a wizard card game will find interesting tactical choices with a comfortable hand of tiles. Have a look inside the box. 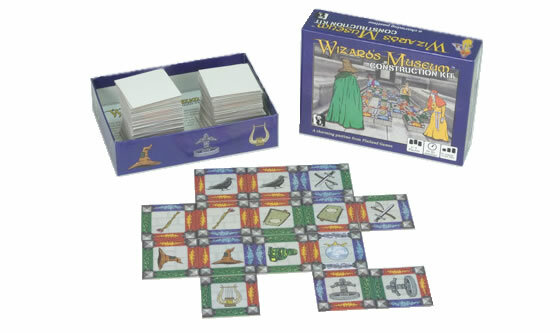 Buy Wizard’s Museum Construction KitTM online here.